Description Excavation photograph - entrance passage and centre of broch during excavations. Originals (2 copies) stored in PRINT ROOM. 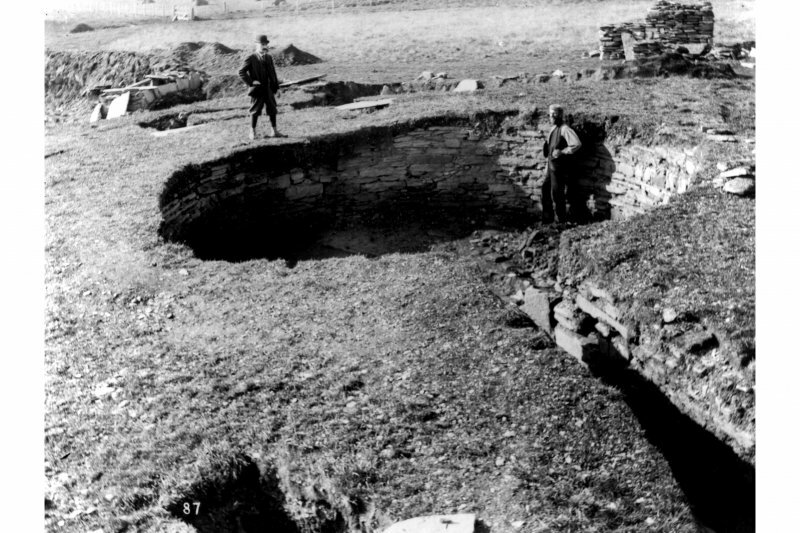 Scope and Content Broch at Nybster, Caithness, during the course of excavations by Sir Francis Tress Barry in 1895 This is one of some 30 archaeological sites excavated by Sir Francis Tress Barry (1825-1907) in Caithness between 1890 and 1906. The structure of the centre of the broch and entrance passage at Nybster broch can be seen in this photograph. In all his excavations, Barry was assisted by his factor, John Nicolson, a local man with detailed knowledge of the archaeology of the area. Nicolson is standing in the centre of the broch. Sir Francis Tress Barry was MP for Windsor, Berkshire between 1890 and 1906. He had enjoyed a distinguished diplomatic and business career, and began to take an active interest in archaeology after his purchase of Keiss Castle, Caithness in 1890. Source: RCAHMS contribution to SCRAN.